Strap made of various materials often with a buckle; it is worn around the waist to adjust the fit of a garment, hold it in place or adorn it. End of the belt that passes through the buckle. Perforation in the belt through which the tongue passes. 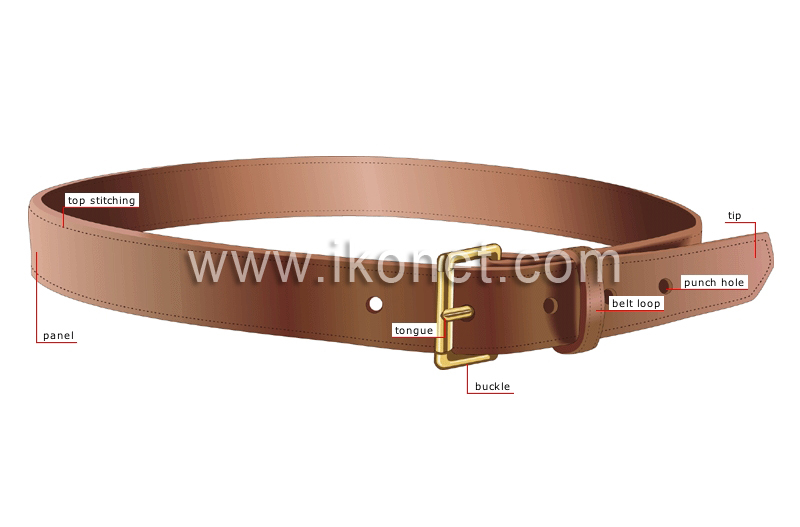 Flat ring next to the buckle usually made of the same material as the belt; one end of the belt passes through it. Metal tip that pivots on the buckle’s axis and fits into a hole, buckling the belt. Smooth side of a piece of leather. Stitching used to embellish the belt.